My 2-year-old is still very into tracing her hands and feet, so when we needed an activity for this week’s Toddler School and with the upcoming holiday, this was perfect. Cut a hole in the center of the paper plate. 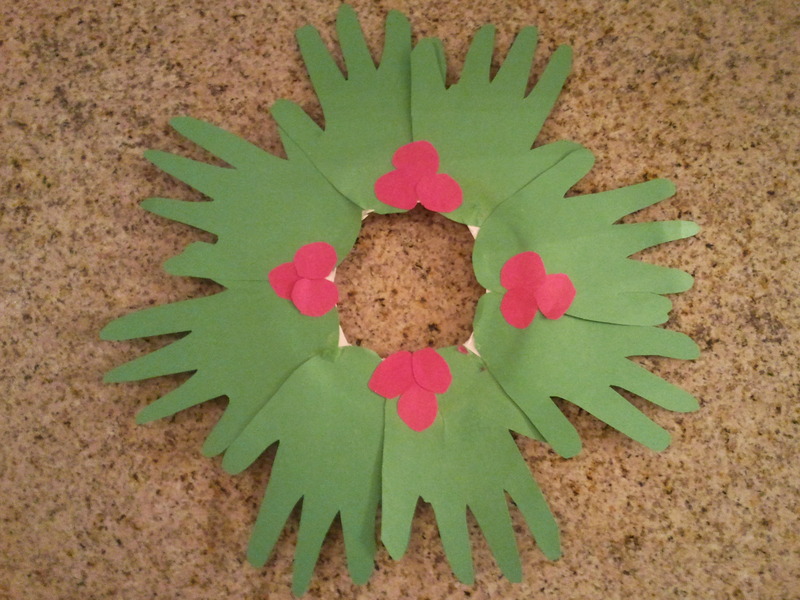 Fold 2 pieces of green construction paper in half. 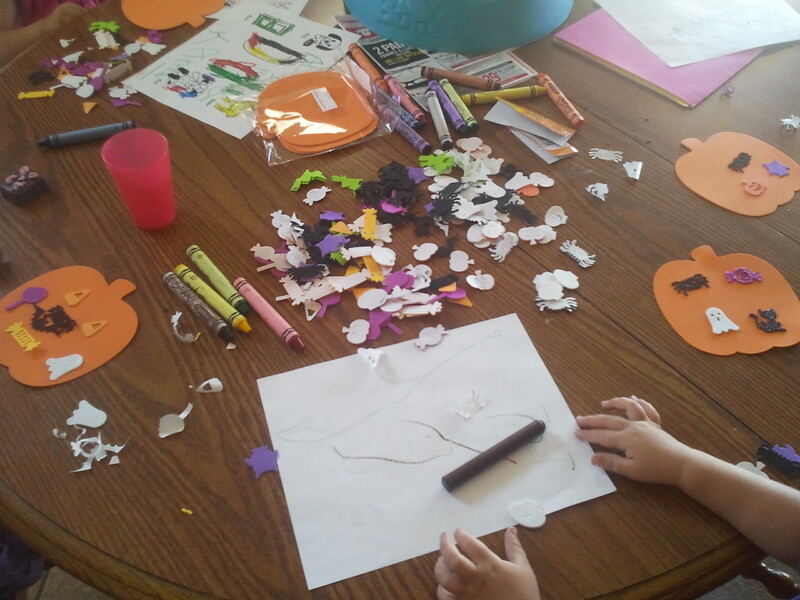 Trace the child’s hand on one side of each piece of paper, then keep paper folded while you cut. This gets you 4 handprints at once, 8 total. Cut some small circles of red construction paper for the berries. Glue the green hands on the bottom of the paper plate, around the opening. Glue on berries. Enjoy your new decoration! This week we did a letter E worksheet. Let me tell you, it was a little tough to come up with E words that they would recognize or that they wouldn’t things was something else. In the end, I think it turned out good. I searched for a while for some new activities to do. I came across these number printables and figured since we had worked on number recognition somewhat last week, that it would be fitting to work on numbers again this week. I ended up printing out all the printables available and laminated them, then cut them apart. This week we only used the numbers with the colored dots on them. 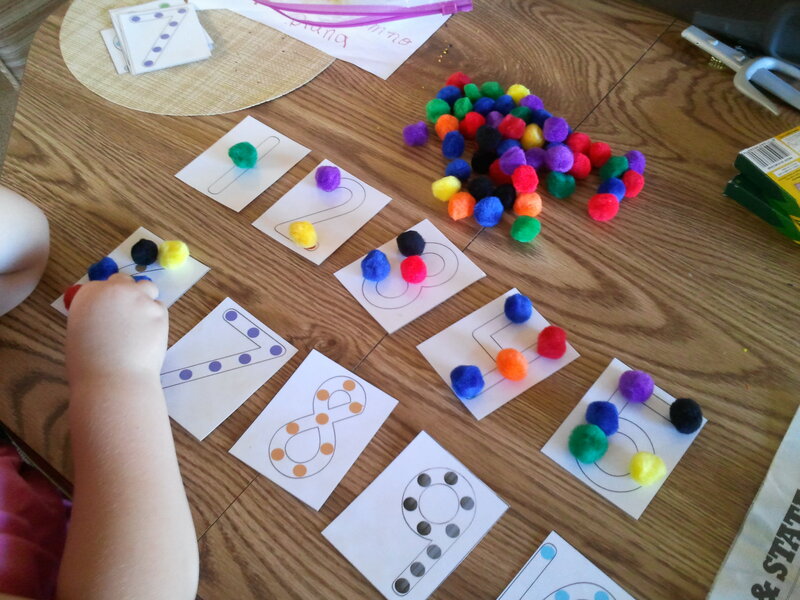 Then, I got colored pom poms at the dollar store, and we used those to put on the colored dots to practice counting. Then, we did something more crafty, we made butterflies like I had found on Pinterest. 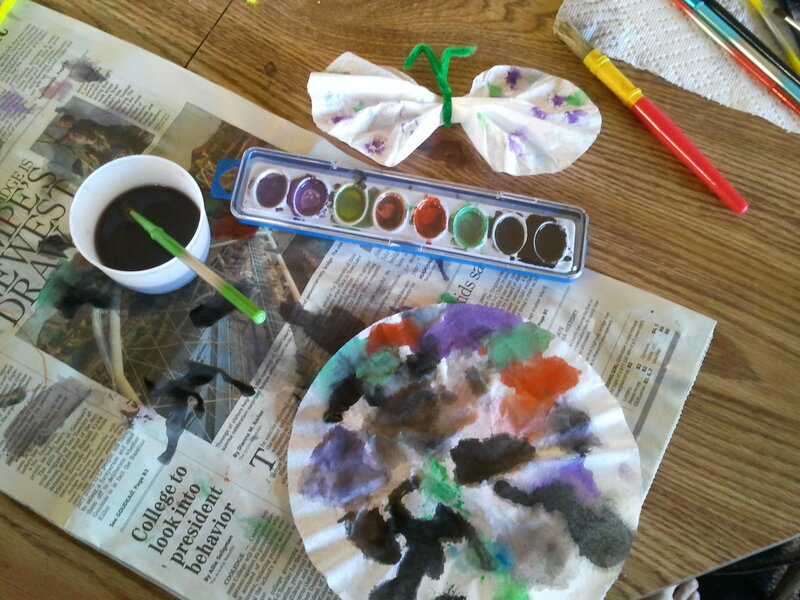 You flatten a coffee filter, then paint it with watercolors. Once it is dry, you fold it accordion style. You cut a pipe cleaner in half, then fold that half around the folded coffee filter and twist a couple times. Bend the ends for the antenna. This week I decided to start keeping the activity materials together in gallon size zipper bags, much like busy bags. I will have a post coming up talking about busy bags, the ones I have made, and some ideas for new ones. Last week we weren’t able to meet because my friend’s kids were sick. So, even though this week is Fall Break for the older kids, we got together and had the older kids do some of their own activities and do some activities with the younger kids. I needed to do some prep work still for the activities, so first the kids all colored the D worksheet I made. Again, this is to introduce the letter for recognition and simple words that start with that letter. For the older kids, we had them also write their names and write uppercase and lowercase Ds. Next, I had gotten some foam pumpkins and various Halloween foam stickers in the dollar section at Target a few weeks back, so I got those out for them all to decorate. Next, we divided up the older kids and the younger kids. For the older kids, I picked out pipe cleaners in colors the corresponded to the bead colors that I have. Then, I put a piece of tape at the top of each pipe cleaner and put a number. Then, I had them sit and put beads on the pipe cleaners, they had to match the color and put as many beads as the number on the tape. They both did really well with this. While the older kids did this, the younger kids got to play with a sensory tub. I had purchased some foam puzzles at the dollar store, 2 with numbers 0 – 9, 2 with the uppercase alphabet, and 2 with the lowercase alphabet. 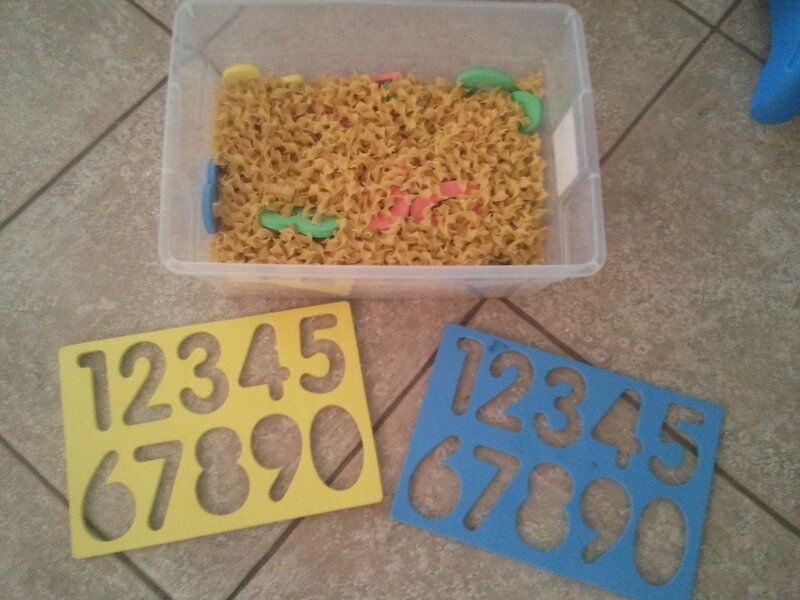 I took the numbers out of the puzzle and put them in a plastic bin, then put egg noodles in to bury the numbers. So, they had to dig through the noodles to find the numbers and put them in the puzzle. 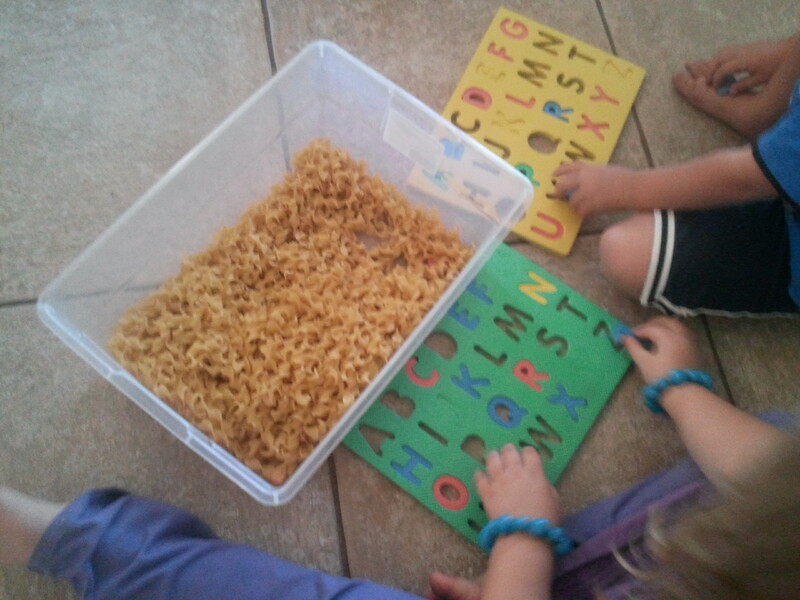 They had a lot of fun playing with the noodles and finding the numbers. We did work on recognizing the numbers as well. The younger kids were pretty much done at that point, it was enough activities for them for one day. The older kids wanted to try out the noodles in the tub, so I got out the uppercase and lowercase letter puzzles and hid those letters for them. Next week, we’ll do the letter E, and I’m on the hunt for some new activities! For this week, we started with coloring a Letter C worksheet I had created. I didn’t have time to get items together that started with the letter C this week, so we just talked about the things on the worksheet. 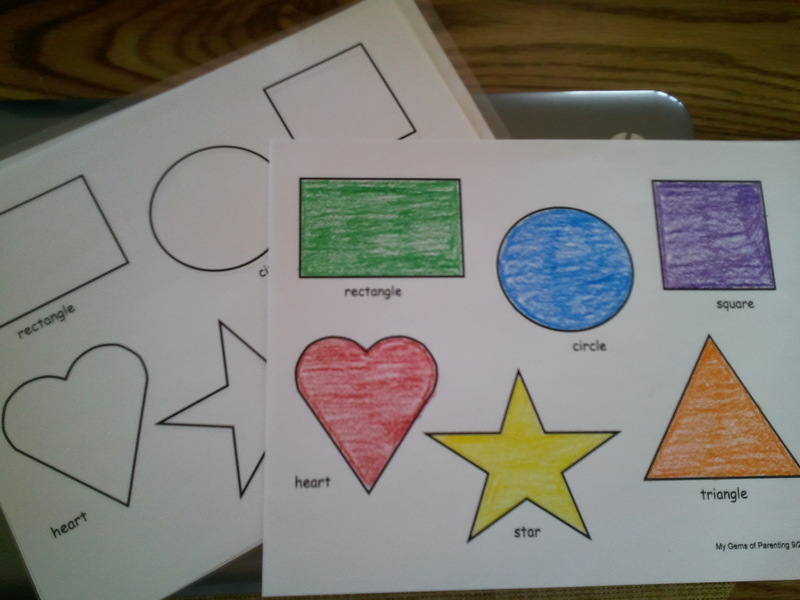 Next, we worked on shapes. I had come up with idea to create a sheet with shapes, then have cut out shapes to match them, maybe using double sided tape. But, then I ordered a lamniator over the weekend, I decided to use it for the sheets and cut out shapes, then put velcro circles on the back so that they could be re-used. 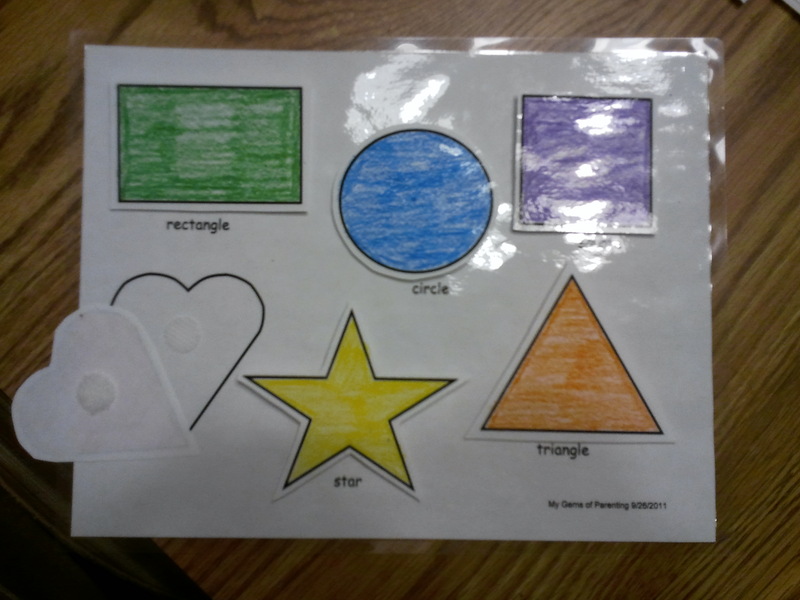 So, I printed 2 copies of the shape worksheet and colored one of them with crayons. Then, I laminated both of them. Next, I cut out the colored shapes, and added the velcro circles. It went over very well with the kids! Next, they wanted to do the color match activity again. I laminated a piece of paper in each color this time so they would be re-usable too. I also added the color name to each one. I know they aren’t anywhere near reading, but at least it’s exposure to the words. We also got out the water beads again. That was about all the attention we got out of them for the afternoon, so we went for a walk. This week for Toddler School we had a few extras, my friend was watching a 3-year-old and 1-year-old, plus another friend with a 2-year-old decided to join our weekly learning adventures. Even though it was a little chaotic, we still got through a few activities. First, we started with coloring a Letter B worksheet that I created. I also brought some toys that start with the letter B, a bird, a bear, a baby, and a book. 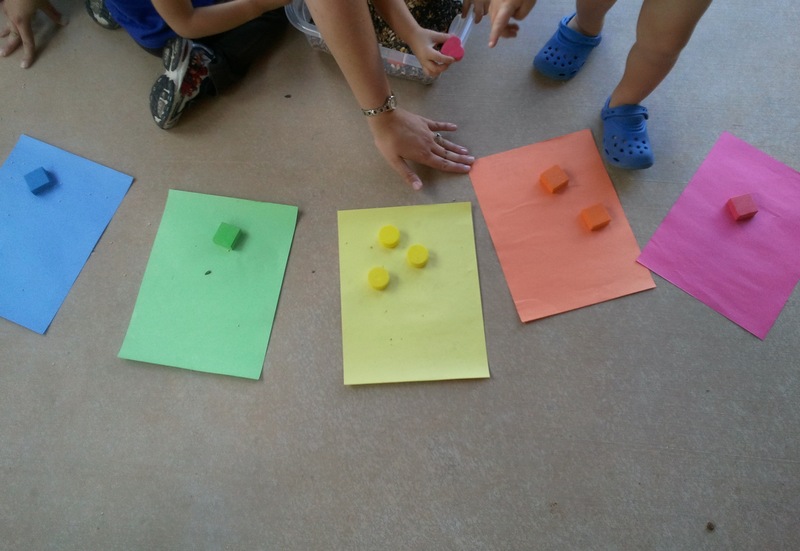 Then, we went outside to do the color match activity with the foam shapes that we did last week. 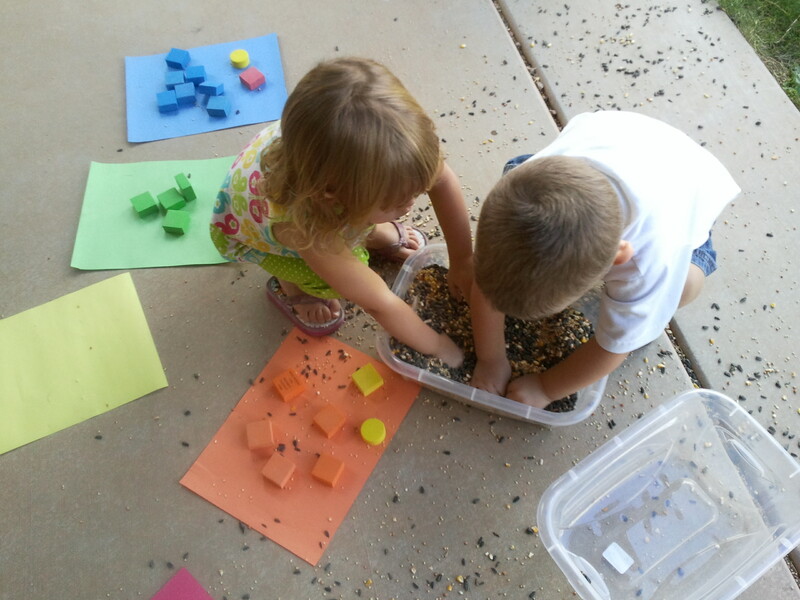 However, instead of the water beads, I filled the tubs with bird seed. We chose bird seed because we knew it would be messy, so we wanted to do this outside, but were worried about not getting all the rice picked up and didn’t want the birds to get rice. Plus, bird seed starts with B, so it fit in with the letter B theme. That activity got a little out of control, with bird seed all over, so we moved on to pipe cleaner activities. 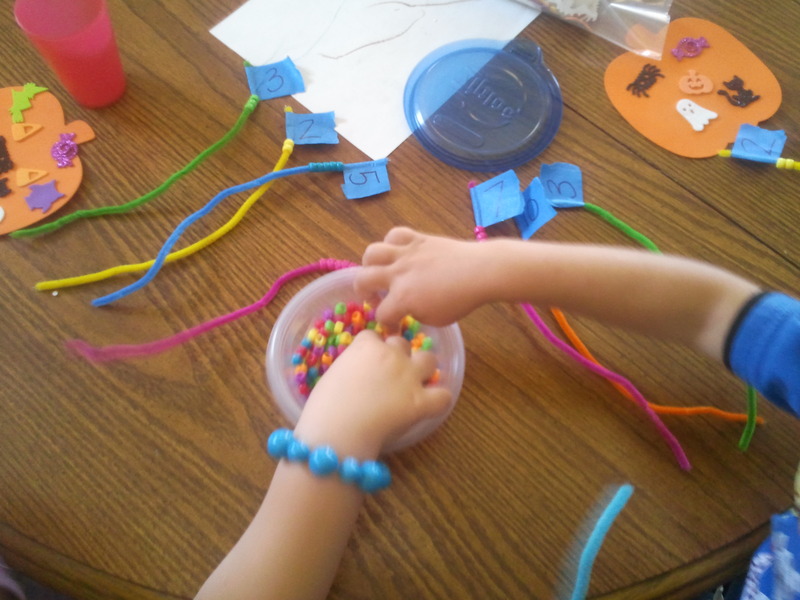 First, I got out the beads to work on motor skills by getting the beads on the pipe cleaners. We tried to do some color matching with this, matching bead and pipe cleaner color, but focused more on just getting the beads on. That was challenging enough for little hands! 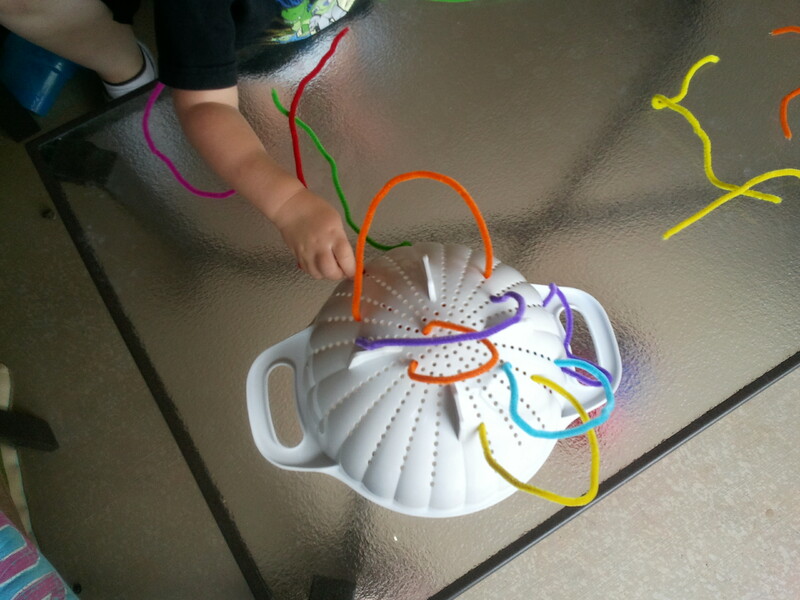 Next, we got out a plastic strainer with holes to make pipe cleaner rainbows. After that, we just played and watched a movie until it was time to get the big kids. We have some fun things planned already for next week! A friend of mine has 3 kids, 2 of which are around the same age as my 2 kids. Our older kids go to pre-K in the afternoons now, so we decided we wanted to do something with our 2 year olds while the older kids are in school. We both felt like we had plenty of time to work on things with our older kids while they were the only kids for a while, but our second kids haven’t gotten the same attention from us with learning. After seeing some fun activities on different websites, I have been making trips to the dollar store to get supplies. I’ve already done some fun learning activities with my older daughter, so now it was time to try out some activities for my younger daughter. Neither of us has a background in early childhood education and we aren’t following any type of curriculum. Our kids are just 2, so we don’t want to push them too hard and we want to have a lot of fun while we learn. We decided we will meet once a week to do some activities together. Today’s focus was on color recognition matching, matching pictures, and the letter A. 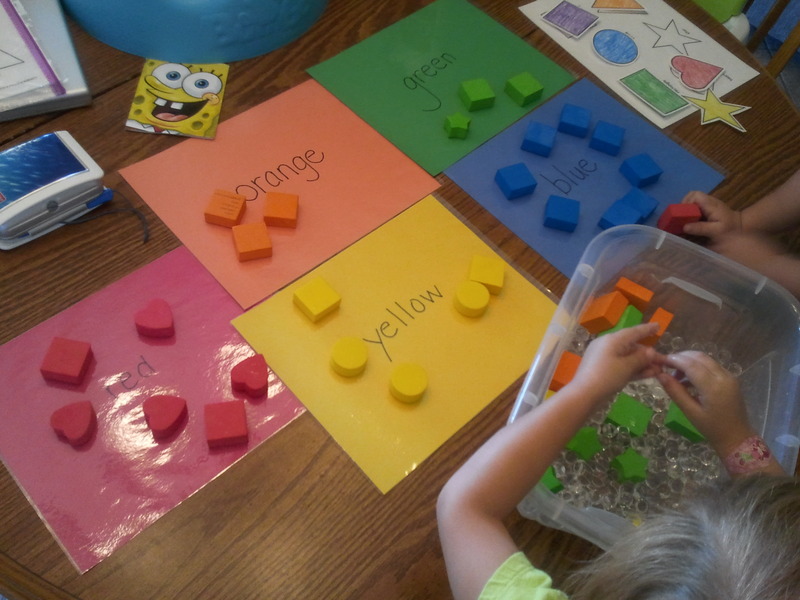 The first activity was on color recognition and matching, which was also a sensory activity. For this, I used 2 bags of colored foam shapes from Target dollar section, 2 containers of water bead decorative accents from the dollar store (found in the floral section), a plastic shoe box from the dollar store, and 5 pieces of construction paper. If you aren’t familiar with water beads, according to the container, they are a type of water absorbent polymer that absorbs, stores, and releases water. They are usually used in plant or floral arrangements. It also says they are non-toxic, but we kept a close eye on the kids while they played with these to make sure they didn’t put any in their mouths or left any out on the floor. I put the foam shapes in the plastic shoe box, then poured both containers of water beads in the box. 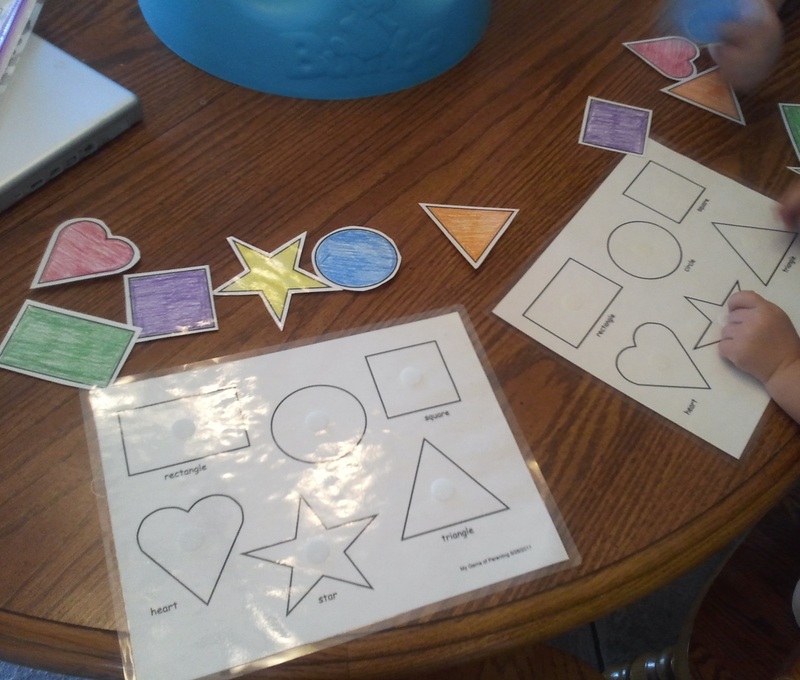 Then, I laid out construction paper in colors that corresponded with the colors of the foam shapes. 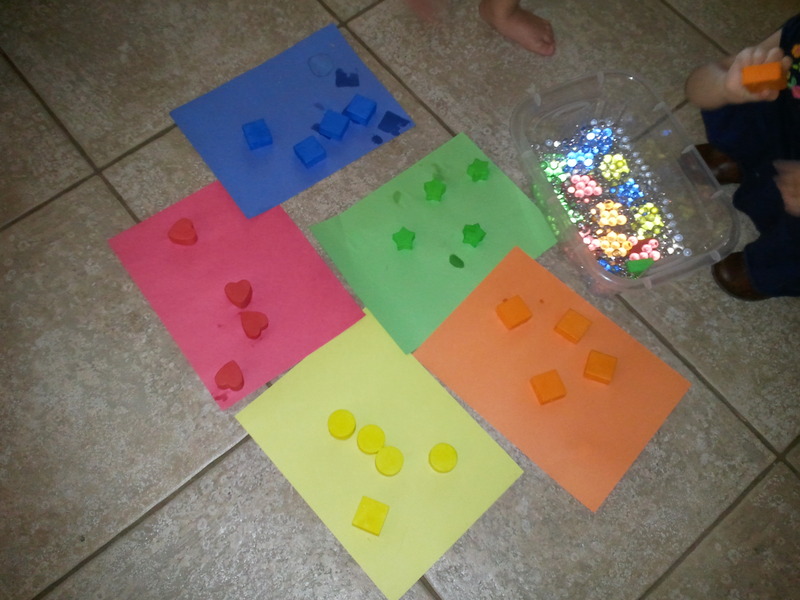 The kids then had to dig through the water beads to get the shapes, identify the color, and match it to the paper of the same color. This activity was a big hit. They loved playing with the water beads, and I have to admit, I thought they were pretty cool too. Of course, for a while, every color was blue but we kept working on it. 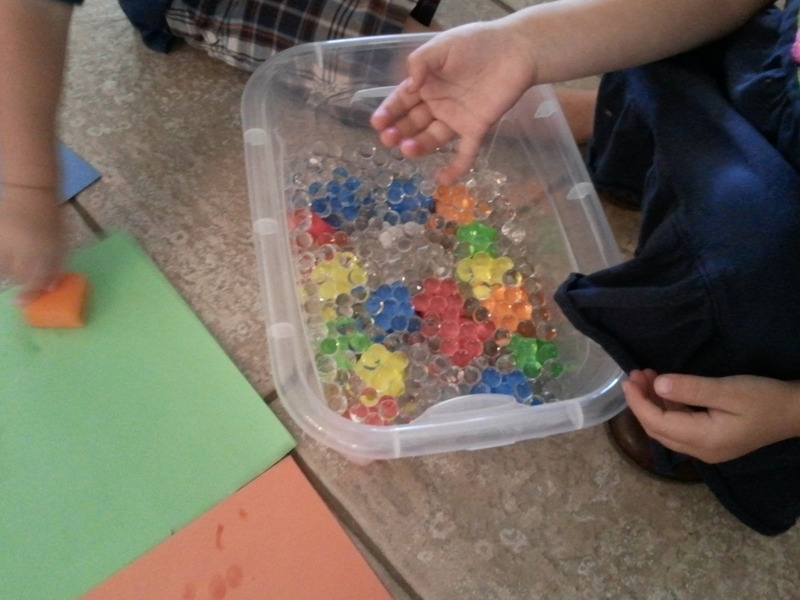 I think we will do this next week as well, but pick something different to fill the box with instead of water bead. I think we might try bird seed to dig through. Next, I brought our Curious George Matching game. The night before, I went through and divided the cards by the color of the frames, the red, the yellow, and the blue. That way there weren’t so many cards all at once. So, we took one of the three sets and laid them out picture side up. We tried to take turns, but for the most part, it was just whichever kid found the match first. At first, they weren’t really sure what to do, this isn’t a game either of us has done much with the kids, but after a couple matches, they caught on. We took a little time out to play outside. Both kids were a little sleepy because they didn’t get much of a nap, so it was hard to get them to focus after playing outside, so the last activity we didn’t push too much. It was to learn about the letter A. I created a coloring sheet with an uppercase and lowercase A, along with pictures of things that start with the letter A. I also brought some items from around the house with the letter A.
I think the first week went really well. We now know about how long we can keep their attention, so I think next week we’ll just do 2 activities, maybe have a 3rd thing planned if we find we have time or they seem like they want to do something else.